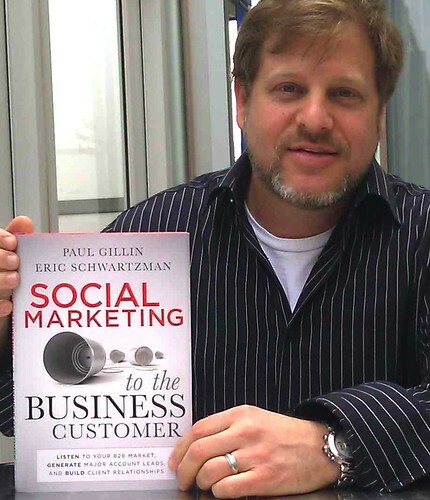 Guest post by Eric Schwartzman, coauthor of Social Marketing to the Business Customer, the first book devoted exclusively to B2B social media communications. He has been conducting monthly social media training programs since 2006 and works as an independent online communications consultant to businesses, the US Military, government agencies and nonprofits. When it comes to selling soap, marketing to Facebook’s 500 million members is a no brainer. But when it comes to selling specialized products and services to business customers, the value of B2B social media marketing can be murky to even the most seasoned business-to-business decision makers. How do you know if your market is active in social media? How do you gauge if they’re open to being sold through these channels? And how do you measure success? Follow these four steps and you’ll be on your way to securing the budget and resources you need to get the job done. Discover Buyer Oriented Keywords – Monitoring the name of company, brand or service is important, but it’s unlikely to generate leads outside of your existing purview. In the book, we show how Paul Dunay of Avaya closed a $250,000 sale by responding to a tweet that said “Time for a new phone system very soon.” In this case, monitoring the phrase “new phone system” resulted in an opportunity. Once you’ve discovered the right phrases to monitor, showing these types of conversations to decision makers is a very compelling way to sell B2B social marketing. Evaluate Your Competitors, Clients and Suppliers – There is probably no easier way to put a fire under management’s feet than by showing them which of your competitors, clients and suppliers are using social media already. Start by using a free tool like Google Reader to build a social media monitoring dashboard (we give step-by-step instructions in the book) and see how your market is using blogs, Twitter, forums, YouTube, Craigslist, Linkedin and other online networks already to drive commerce. Regardless of how niche you think your segment is, chances are, you’re not going to be the first one. Position Social Media as an Extension of Existing Efforts – How has the trade media that covers your industry adapted to social media? Are they blogging on their website? Are they tweeting their headlines? Most organizations get the value of trying to land coverage in trade media. If the journalists covering your trade are active in social media, then participating in discussions with them online is really just a path to a stronger relationship and a way to stay top of mind. From this standpoint, commenting on their blog posts and answering their questions on Twitter is really just a more efficient way of conducting mainstream media relations. Support the Prevailing Corporate Culture – As social marketing gets more mature, and measurement becomes more effortless and easier to grasp, I predict many of today’s old school marketing tactics will ultimately be retired. But for sophisticated B2B marketers reporting to managers with a low-level of social media literacy, that day has not come soon enough. Until it does, marketers should develop strategies conducive to the organization’s existing corporate culture and temperament. 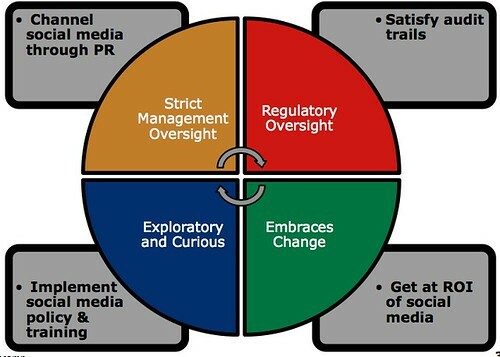 If management wants to maintain strict oversight, propose channeling social marketing through marketing or PR. If they’re exploratory and curious, show them how it works by developing a social media policy and increasing social media literacy throughout their ranks. If they already embrace change and are ready to fail fast, learn from their mistakes and get stronger, focus on the ROI from the start so you can maintain and grow your budget allocation over time. The bad news is that since social media is still relatively new, it gets measured by tougher standards. But the good news is, it’s the most measurable form of media out there. Every view, every click, every transaction is captured, and that data provides better insight into the wants and needs of your customers than ever before. To build the business case, capture and show your decision makers the byproduct of all that collective sharing. Don’t start by pitching a Linkedin group or a SlideShare channel. Take a step back, and collect evidence of buyer related conversations leading to real purchasing decisions. Put together a presentation showing who’s on Twitter, who’s blogging, who’s using relevant Linkedin Groups and who’s prospecting on SlideShare. Visit iTunes and see if any of your competitors have released mobile apps to help them connect with new customers and retain existing ones. Paint a picture of how the social web is being used to drive commerce and figure out where the most activity is so you can strike where the iron is hot. Once you’ve secured the buy-in and resources you need, pick up a copy of Social Marketing to the Business Customer to build a smart strategy and select the social media channels most likely to deliver immediate results.